Does Perfection have its Price? Tonight is Start 1, APG (After Perfect Game) for Dallas Braden, as he and the rest of the Athletics face the Angels in Anaheim, Calif. The question on everyone’s mind, from players to the media to the fans to fantasy owners, is what happens next? How does one follow up perfection? Is it a sign of things good or bad to come, or is it just one of those weird anomalies that helps baseball be so unique? Well, of course, that’s a question I just couldn’t let go unanswered. But there is one major caveat before you read further: since there have only been 19 perfect games in the modern era of baseball, the sample size is very small, understandably. Also, since perfect games have happened across different offensive times, so I only looked at perfect games that occurred during the current high-powered offensive climate we’re in now. That leaves us with five such games (from earliest to latest): Kenny Rogers on July 28, 1994; David Wells on May 17, 1998; David Cone on July 18, 1999; Randy Johnson on May 18, 2004; and Mark Buehrle on July 23, 2009. When I went through these games, all I was looking for was how each pitcher was doing before the big game and how he did after it. Did particular rate statistics increase or decrease by a significant amount for these five? Was there any clearly definitive pattern? The only instance the process was complicated was with Rogers, who made only two more starts after his perfecto before the ’94 season was cancelled due to the players’ strike. After I first looked through the data, I was a little disappointed. Some pitchers were better for the rest of the season after The Game while others bombed out, and everyone’s rate stats were different. But, if you take another look, you’ll see a pattern does emerge, and it all depends on when the perfect game takes place. I saw that half of the perfect games occurred May and the other half in July. When you separate the two, the pattern smacks you right in the face: those who had their moment in the sun in May went on to have great seasons while those that happened in July saw their season take a steep nose-dive. On the surface, that is how simply it appears, but there are a couple undercurrents that should be mentioned. The two pitchers who had perfect games in May, Wells and Johnson, had at least one highly exceptional skill set: Wells was probably one of the best control artists in the last 25 years, while Johnson might simply be one of the two greatest strikeout pitchers ever. Also, with the exception of the then-29-year-old Rogers, all these pitchers were at least 30 years old, so they were able to rely on intelligence and guile as well as their physical abilities to get hitters out. Braden is neither north of 30 nor does he possess a skill set that separates him from the majority of his peers (at least for now). So what does this all mean? Braden’s PG came in May (which is good), but he isn’t well-known for a particular stat or ability (which isn’t good), so should I start him? Sit him? Cut or trade him? Well, in my opinion, I like to think that Braden will have a good 2010 season, but nothing like what Boomer Wells had in ’98 or the Big Unit in ’04. He’s still learning and improving, so I also highly doubt his season will suddenly careen into the abyss, dragging many fantasy seasons along with it. 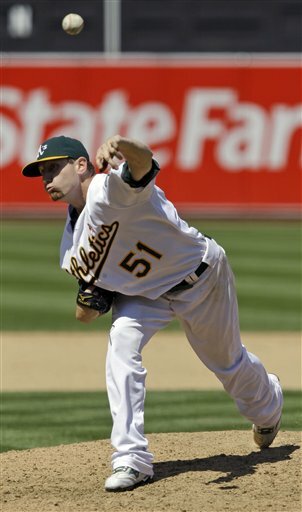 Not only that, but Mr. 209 pitches half of his games in one of the most pitcher-friendly ballparks in the game. Braden is definitely worth keeping on your roster as a back-end starter in mixed leagues and a mid-rotation guy in AL-only leagues. But odds are that your league has a guy who’s pitching is so bad that it would make the Mariners’ lineup look more like the Rangers. Make that guy your new best friend and name your price for the irreverant southpaw. Oh, one more thing. While searching for pictures of Braden, I came across this beauty. It was too good for me to leave alone, so here it is. 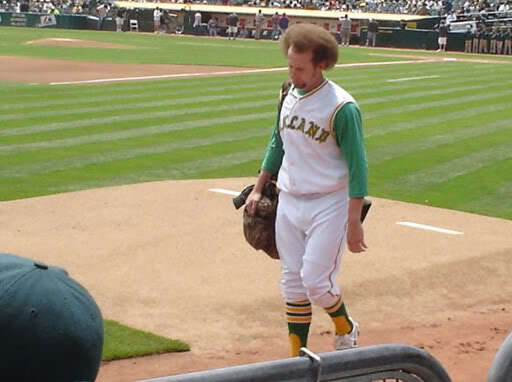 Dallas Braden: Human Time Machine.